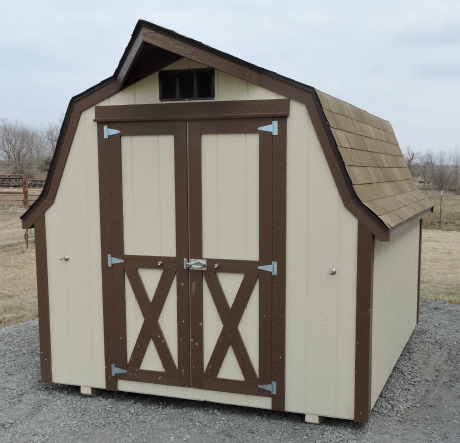 Amish Woodwork is your certified dealer for Sturdi-Bilt Storage Barns. 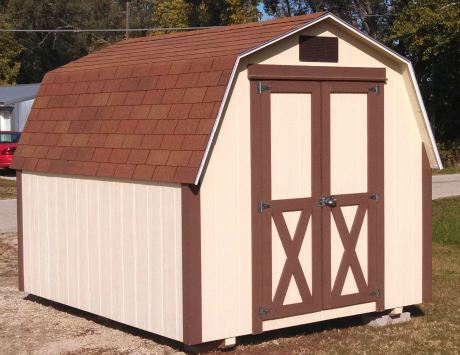 Sturdi-Bilt storage barns are carefully built to order, the way a carpenter builds a house. Standard wood framing techniques and materials are used, scaled to shed dimensions. Two to four – depending on building width – 4×4 pressure treated timber skids form the foundation runners. Floor joists are standard 2×4’s spaced 16 inches on center and covered with ¾ ” Advan Tech flooring… screwed down to minimize squeaks. 2×4 studs frame the walls and are spaced 16-24″ on center (depending on wall height). The 2×4 rafters are spaced 24 inches on center and designed to maximize headroom. The roof consists of 7/16″ exterior grade OSB sheathing covered with asphalt felt and 240 pound/square fiberglass three tab shingles. Woodgrain panel residential siding with reverse battens finishes the exterior – a superior 50 year, insect and rot treated product! Double, swinging doors with choice of six trim styles open a full 5’11” height. 8′ wide buildings have 45 ½ ” wide doors and 10, 12, and 14′ wide buildings come standard with 60″ doors. Doors are strengthened by a 2×4 frame and fitted with top quality latches, bolts, and braces. Sidings and trims colors come in a selection of 14 standard colors or we can match your color preference. There are 9 standard shingle colors and 20 metal roof colors to choose from or we can most times match your roof style and color. The wood floor can be deleted and the building built on-site on your concrete pad. Popular options include windows, shelves, ramps and vents. Steel Sided – Steel-sided Classic Gable and steel-sided Elite Lofted Barns have 7′ side walls, double doors, 29 gauge steel roof, siding & trims, and the Sturdi-Bilt quality you’ve come to expect and trust. Build on Site – In the Case that we are unable to deliver your building or you would like a concrete floor we can build your building on site. © 2019 Amish Woodwork|ProPhoto Photography Blog by NetRivet, Inc.